Upgrade your cookware with the Jamie Oliver by Tefal Stainless Steel Non-Stick 2 Piece Cookware Set. The set consists of a professional quality frying pan and wok. The durable and hard wearing pan is suitable for all hobs, including induction and features Tefal’s scratch resistant and titanium coating with superior non-stick properties. The pan is safe for use with metal utensils, so is ideal for a wide range of cooking, from stir fries and risottos, slow cooked dishes to the full English, all of which will require the minimum of extra fat or oil. The frying pan features Tefal’s iconic Thermo-Spot technology that indicates when it has reached its optimal temperature. With a riveted stainless steel and silicone handle, a pouring lip for drip free serving from all angles, the frying pan is dishwasher safe for easy cleaning and oven safe up to 210°C. 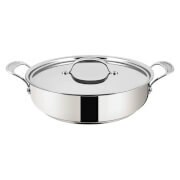 Cook stir fries, pasta sauces and risottos to perfection without sticking or burning or uneven cooking. With a titanium non-stick coating, the wok is safe to use with metal utensils (except knives and whisks), so is ideal for Chinese cooking, whilst the high, curved sides make it the perfect shaped pan for recipes that require constant stirring whilst maintaining a tidy hob. 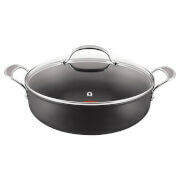 The wok features Tefal’s iconic Thermo-Spot technology, a riveted stainless steel handle with a silicone insert and a pouring lip ideal for capturing delicious cooking juices and sauces without drips. 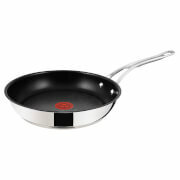 The versatile wok is suitable for all hobs, including induction and is dishwasher safe.